Get A FREE Shamanic Empowerment Meditation to charge up your first 3 chakras and connect to your heart's radiance. 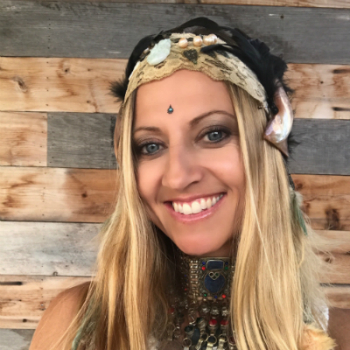 Nicole services humanity as a Women’s Empowerment Coach, Trauma-Informed Emotional Healer, Shamanic Reiki Master, Ceremonialist, E-RYT 500 YogaWorks Yoga Teacher Trainer, and Medicine Woman. Nicole empowers the awakened woman on a healing path to breakthrough her limiting beliefs, unleash her priestess power and actualize her visions! Through her authentic vulnerability, powerful voice, strong intuition, and lightness, Nicole co-facilitates her clients through a deep alchemical process with Spirit and helps to empower them to activate their highest potential. It's refreshing to meet some one that has found their true calling in life, I view Nicole not only as my Yoga instructor, but also as a powerful Healer. She is extremely knowledgeable in her area of expertise and in tune with her client's needs. Nicole treats each session as a rejuvenation and rebirth ceremony... her focus, attention to detail and guidance are unparalleled. I highly recommend her. We can create positive changes in our lives, but the real challenge is maintaining them. It’s about making positive choices consistently that supports the work you are doing. Being busy at work, major life events, and travel are all great excuses that give us "an out" to not maintain our practices. After years of seeing how her Clients would jump in and out of their body-mind practices, Nicole decided to become a Life Coach to help her Clients stay on track for longer periods of time. As your life coach, she becomes your loving, powerful guide and accountability partner on your journey of personal transformation. Nicole will support you in building new pathways and habits in your life and business that will empower your personal evolution and support your overall well being for long-lasting and fulfilling results. The healing arts encompass a wide range of teachings that deal with life force energy or Prana. With healing intention, Nicole works with various energy systems that constitute your body to help facilitate the healing of your physical, emotional and mental suffering. Some key benefits of energy medicine work are the healing of the physical, emotional and mental states; clearing of abuse and sexual traumas; releasing limiting beliefs and re-patterning old stories and conditioned behavior; changing addictive behaviors and maintaining lasting health; removing energetic blockages to cure ailments and prevent disease; increasing your vital energy and finding your power; attuning to a higher vibration, frequency and plane of consciousness; linking up to the universal matrix of energy, love and spirit. A consistent yoga practice offers incredible benefits for the body, mind and soul through the use of movement, breath and meditation. Yoga provides an overall sense of well-being and is a path to wholeness and long-term sustained joy. Some of the key benefits for the body are the reduction of stress, improvement of flexibility, increased strength and vital energy, creation of endurance and better sleep. For the mind you can find harmony, balance between the hemispheres of the brain, reduction of mental chatter, and a true shift in thinking through observation and meditation. For your soul, you can access your Higher Self, connect to your Divine wisdom and find your Soul’s purpose. Nicole teaches public classes, private sessions, workshops and retreats.